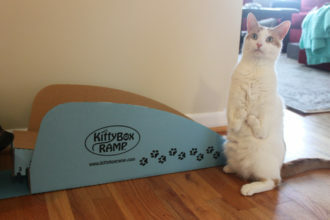 Artemis enjoys "ex-purr-loring" alongside his owner. Kenny catches a lift on the shoulders of his owner, Zac Robinson. 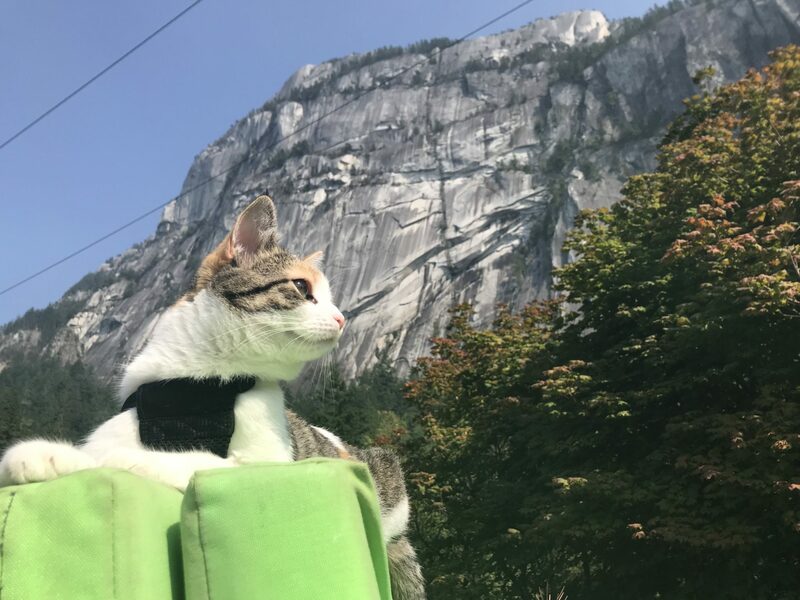 Zhiro loves to enjoy the view from atop his owners' crash pads. Cali is right at home in the meowntains. Artemis keeps an eye on her fellow climbers. 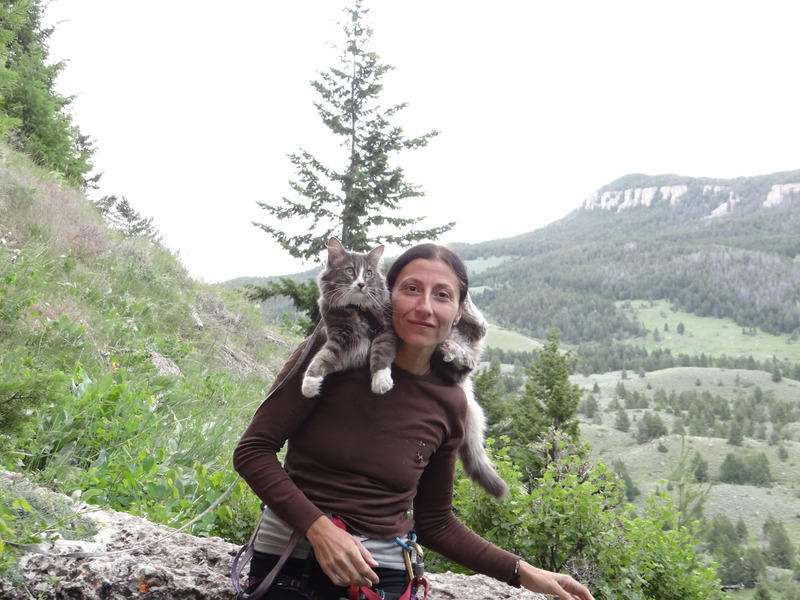 Sandra Samman poses with her courageous crag cat, Denali. 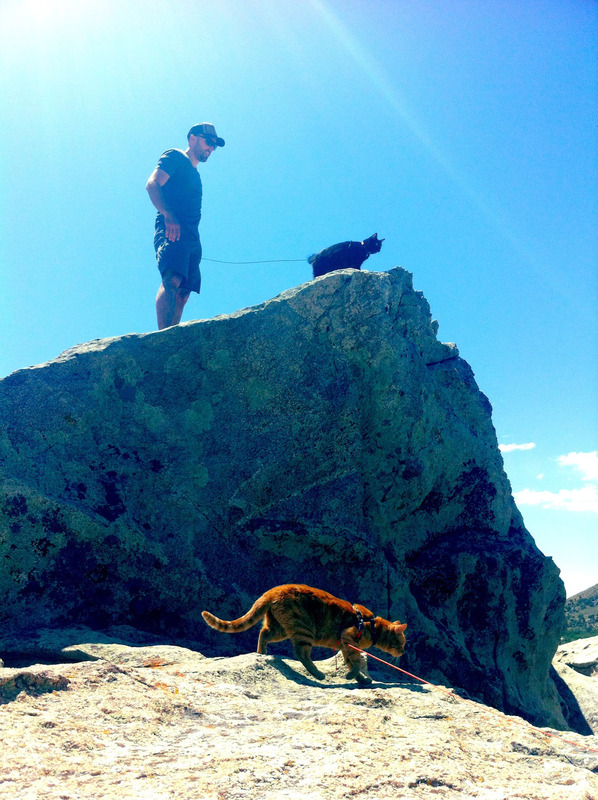 Craig Armstrong frequently takes his cat, Millie, climbing in Utah. 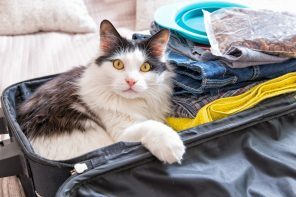 If you want to take your kitty climbing, there are many things to consider before you grab the leash and your gear and head out the door. 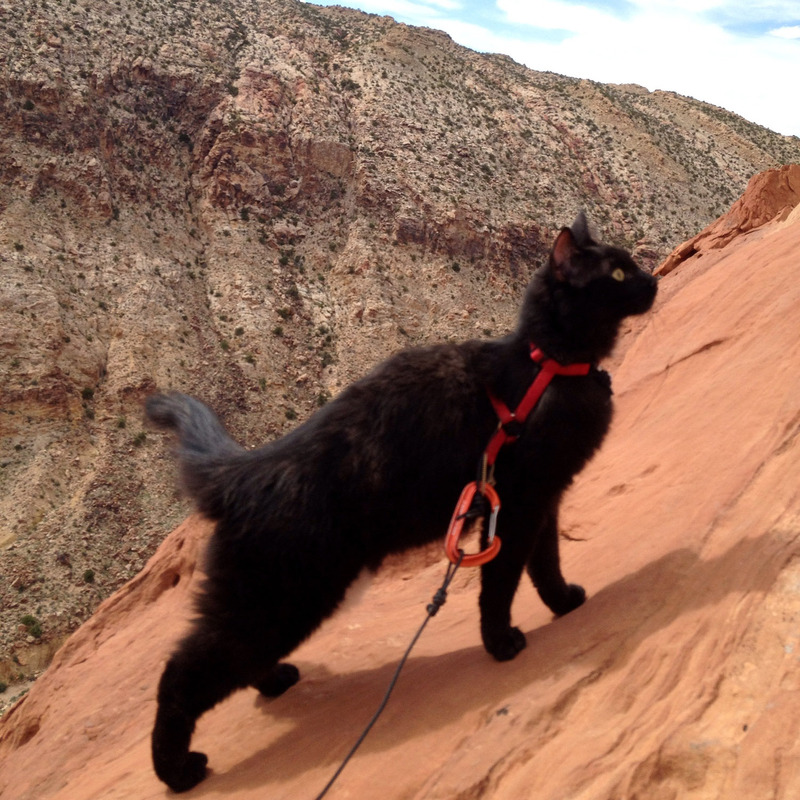 Regularly venturing outdoors is the biggest tip that crag kitty owners emphasize. 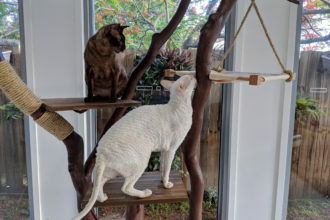 “Artemis didn’t start liking the outdoors until we started taking her outside every day,” said Los Angeles resident Taya Treulieb-Kolostyak who named her 1-year-old rescue cat after a Greek goddess. 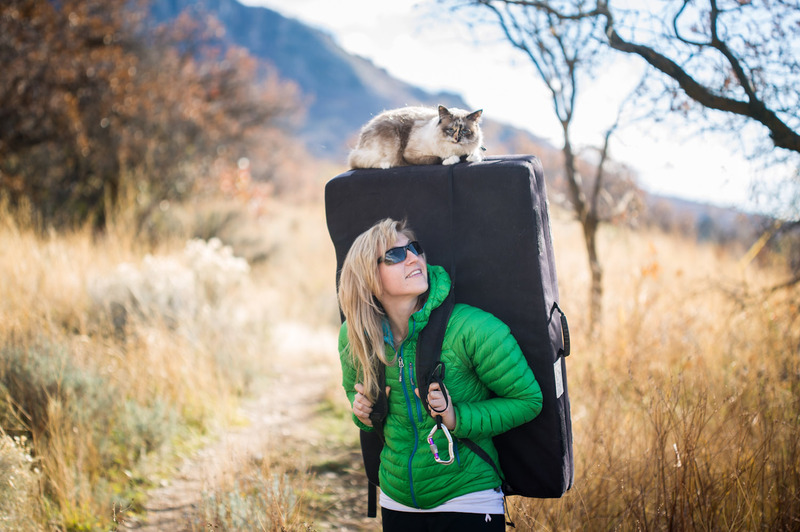 Sandra Samman of Boulder, Colorado, began taking her longhaired tabby, Denali, on walks right after she adopted him, and he accompanied her to Wyoming’s Ten Sleep Canyon at just 3 months old. 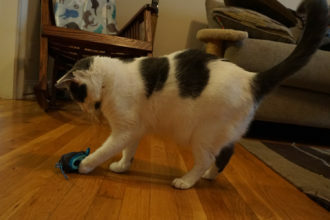 “If you condition a cat when they’re a baby, going outside isn’t a problem,” Samman said. 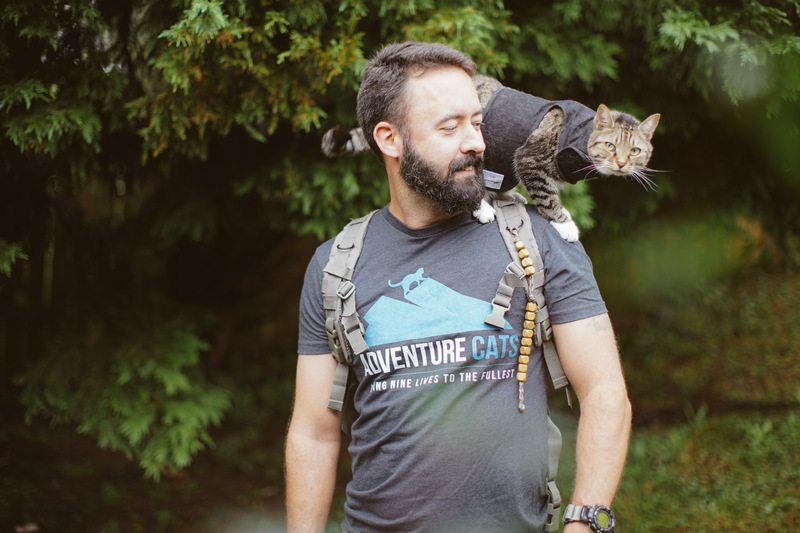 When his cat Cali was a kitten, Evan Wiltzen would always put her on his shoulder to get her used to being a “shoulder cat” during hikes. 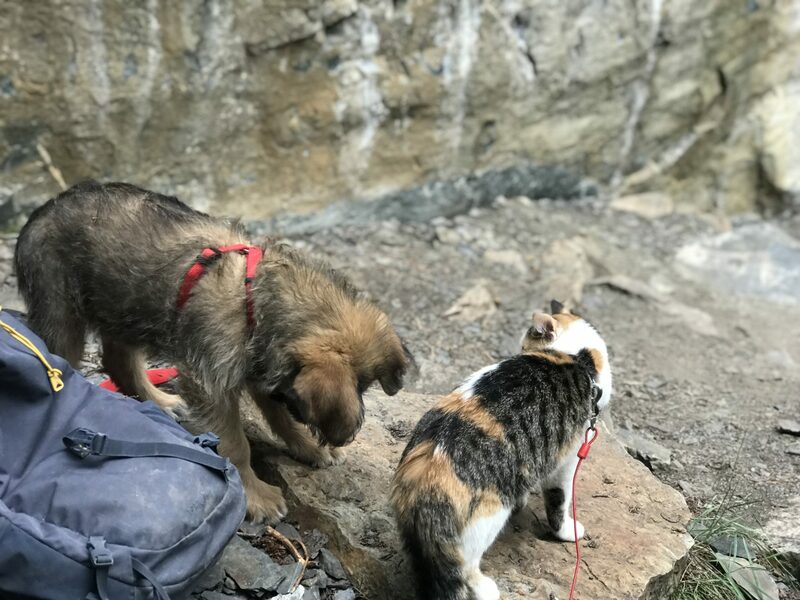 Evan’s climbing gym in Alberta, Canada, allows pets, so he was able to get Cali acclimated to wearing her harness and approaching other people and their pets on a regular basis. Denali is so comfortable on climbs that he often grooms himself on the way up. Train at home before you go. 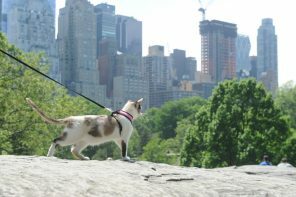 In addition to leash training, it’s a good idea to train your cat to come when called before you ever venture outdoors. Cats are certainly trainable animals if you implement positive-reinforcement techniques, and you’ll be glad your feline friend learned this skill if you ever have to use it. “It’s important to have them respond to their name, so you can call them back if danger arises,” said Samman, who says she constantly calls Denali by name and rewards him when he responds. Cali is accustomed to making friends of the canine variety. Dogs can make things complicated at a crag. 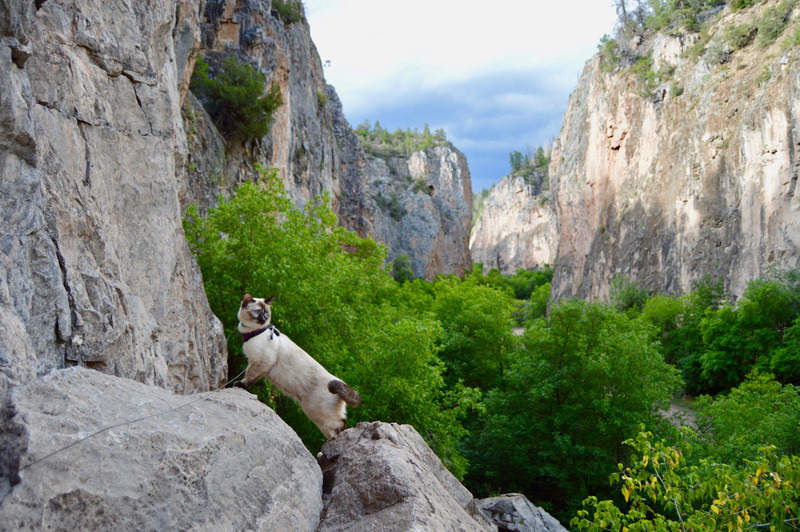 Many climbers own dogs, so you should always approach a crag expecting to see a canine. Some crags — such as Pipedream in Utah’s Maple Canyon in the summer or PMRP (Pendergrass-Murray Recreational Preserve) at Kentucky’s Red River Gorge in the fall — can be crowded with packs of unleashed dogs. So if you’re planning a climb at a popular crag, it might be best to reconsider and go somewhere else. 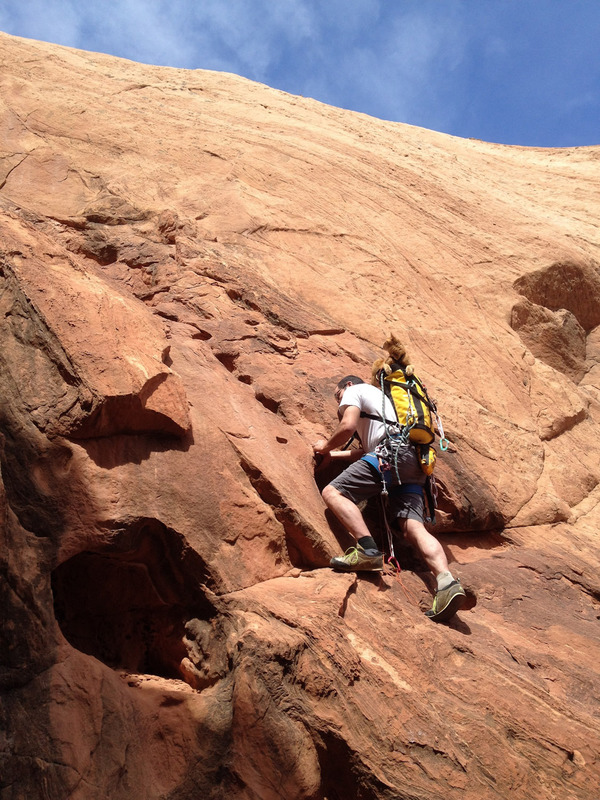 Also, ensure fellow climbers are on the same page about leashing their pets because animals can be unpredictable. In fact, Samman says she’s had issues with dogs trying to attack Denali in trailhead parking lots. However, Wiltzen says that Cali, who’s now 1 year old, has plenty of four-legged friends at the climbing gym. 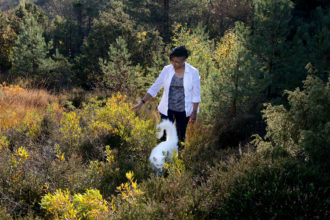 In fact, most dogs “are more apprehensive of her than she is of them,” he said. Treulieb-Kolostyak says that if there are dogs around, she keeps Artemis in her backpack while she’s climbing. That way the belayer doesn’t risk losing concentrating on the climber at any given moment. Millie and Kenny say it’s ‘impurrtant’ to stay leashed. The majority of public parks and climbing locations require pets to be leashed, so bring a leash out of respect for these outdoor areas. Samman suggests bringing different leash lengths. 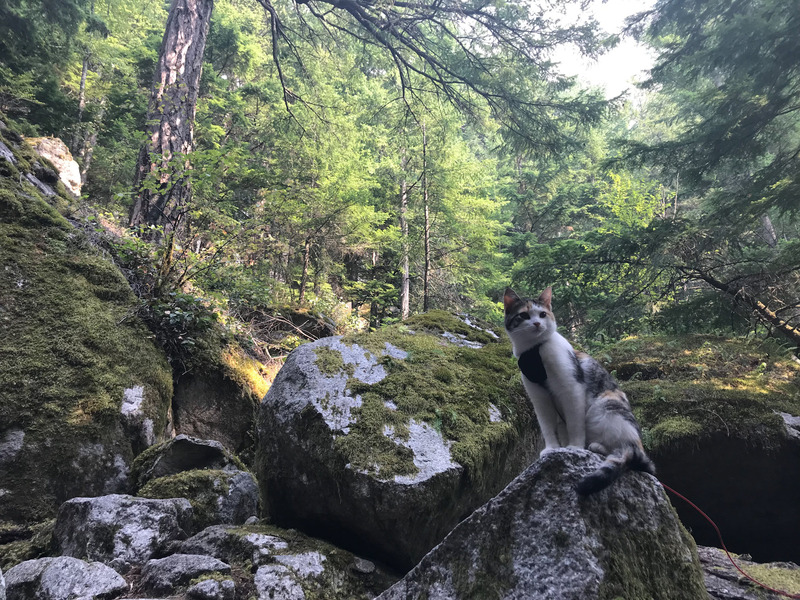 That way if you’re the only climbers at the crag, your kitty can roam on a longer leash or stay close by with a shorter length if dogs or people are nearby. Artemis appreciates having a safe place to grab a catnap. 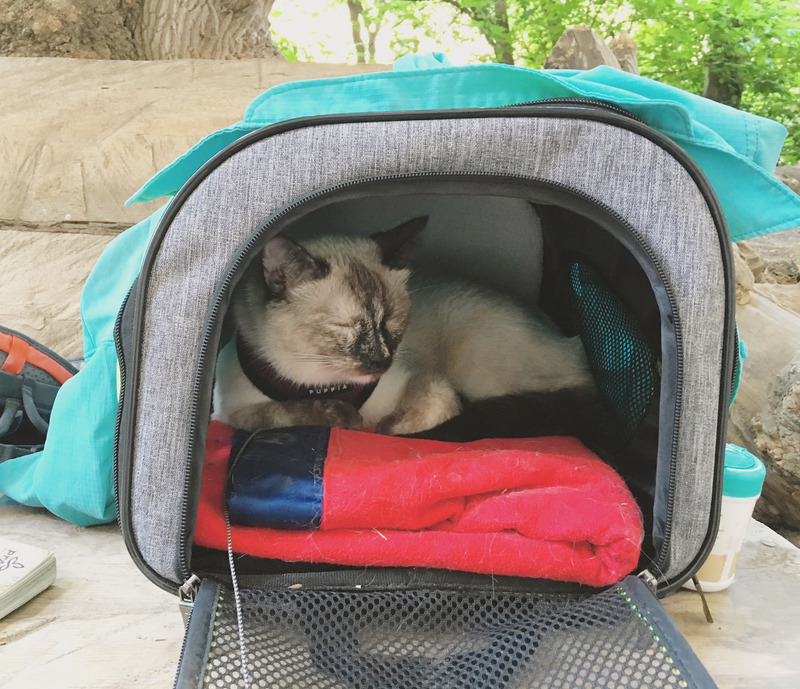 Treulieb-Kolostyak brings a cat carrier or backpack to the crag so if Artemis is ever scared “she has a safe space to retreat into.” She says this also helped with Artemis’ anxiety the first few times she went outside. She also leaves Artemis’ carrier out in the house so that her crag kitty will remain accustomed to having the pack around. 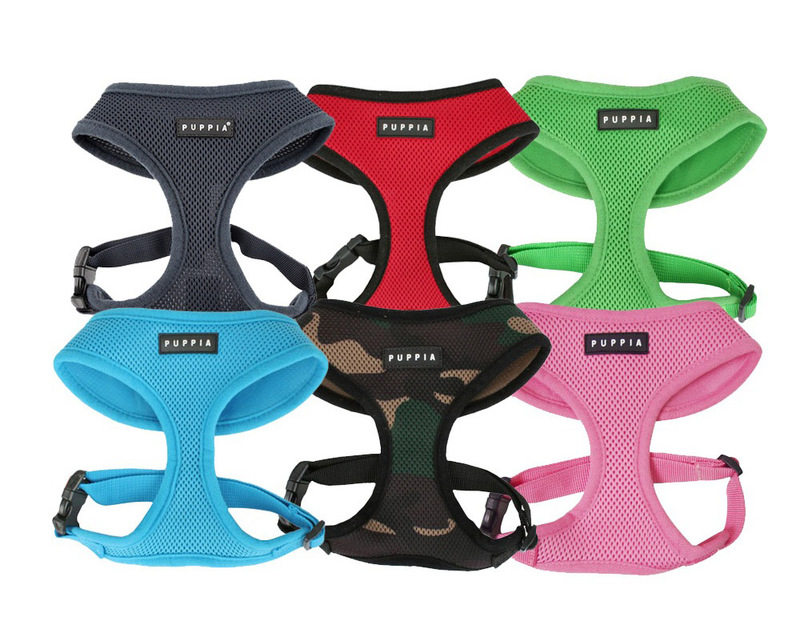 This also helps him refrain from associating the carrier with stressful situations such as trips to the vet. 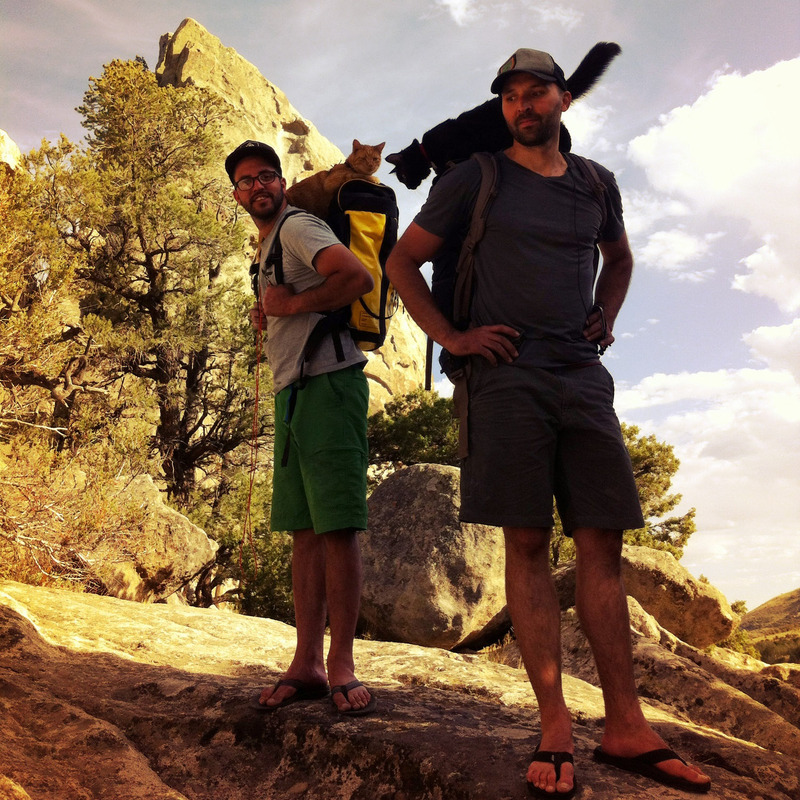 Craig Armstrong and Zac Robinson are changing people’s minds about adventuring with cats. 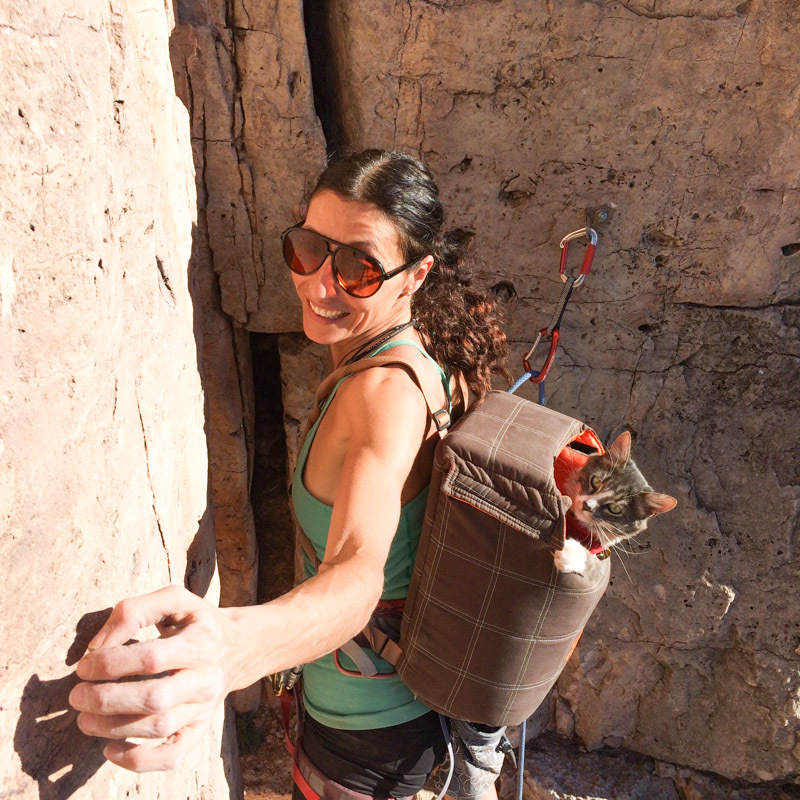 Most climbers aren’t accustomed to seeing a cat at the crag, which can be a source of conflict. Both Treulieb-Kolostyak and Samman report hearing fellow climbers make snide comments about their four-legged climbing partners. On the other end of the spectrum, Evan recalls one climber he met becoming so captivated by Cali that the woman spent the whole day petting her. 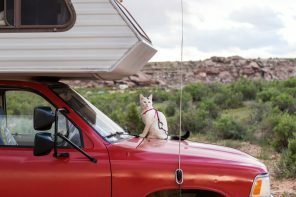 There’s an endless array of opinions relating to whether cats — and dogs — should be allowed at climbing destinations, so it’s best to be aware of these mixed feelings. Artemis takes in the ‘meownificent’ view. 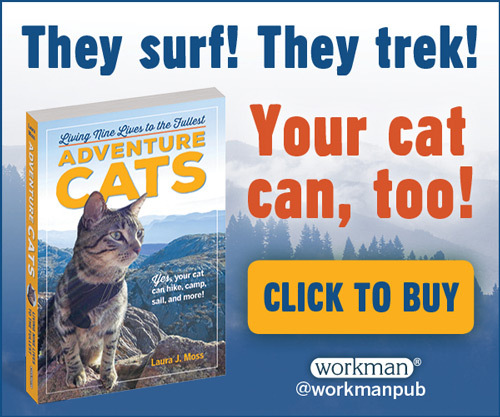 While there may be some naysayers, there are also plenty of outdoors lovers who enjoy their encounters with adventure cats. 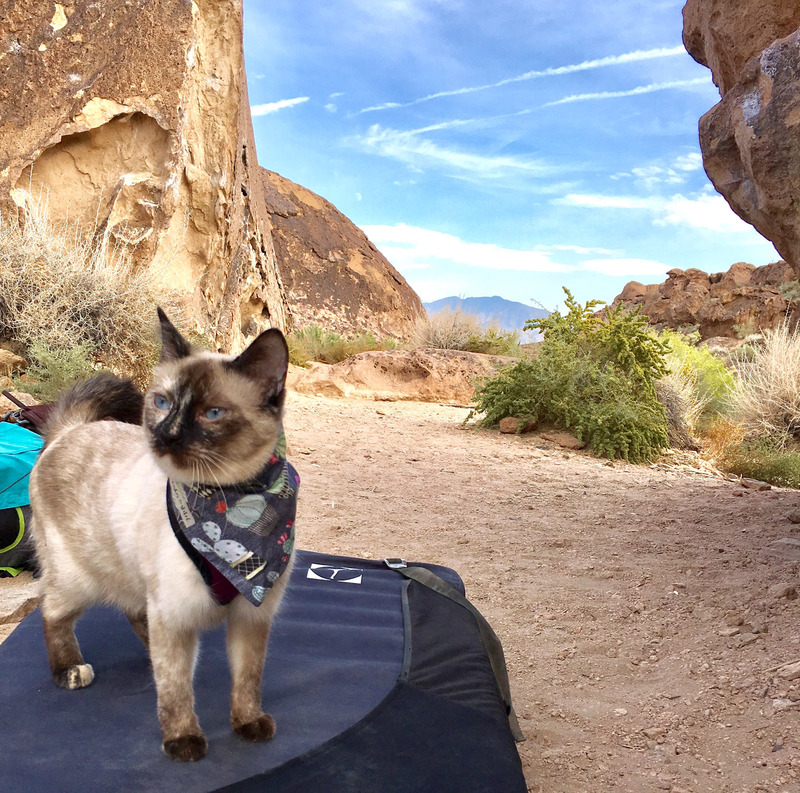 Of course, the benefits of bringing your feline friend along for the adventure aren’t just for you — your crag kitty can reap the rewards too. 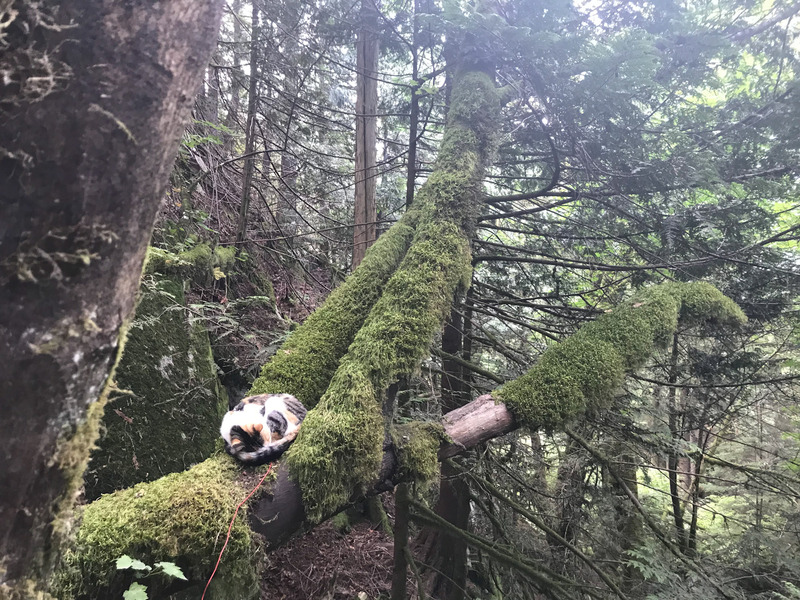 Cali takes a catnap in the woods. 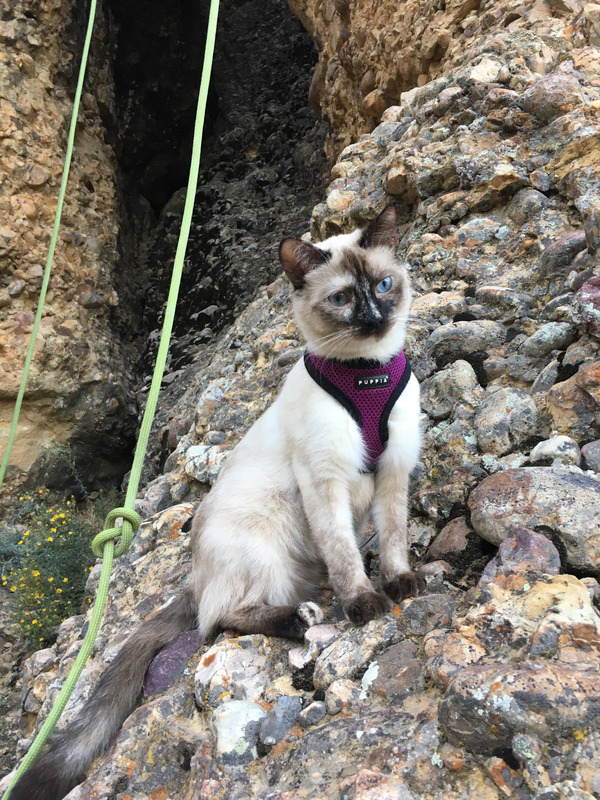 Scroll through the gallery at the top to see more photos of crag kitties, and keep up with all their adventures by following them on Instagram: Artemis, Cali, Denali.